Reminder: Tomorrow starts ISTEP for 10th grade students. We will start the day with SRT. This will occur on Tuesday and Thursday the next two weeks. It’s not too late to order your 2015-2016 yearbook. Purchase one now for $50 before the price goes up! Order online at Jostens.com. The Career Center field trip has been rescheduled for Thursday. We will leave at 9:20 a.m. and return by 11:45 a.m. Please meet at door M by 9:15 a.m. that day. Only students who turned in their permission slip and are on the list in Guidance can go. The bus is full, so we are not able to add anyone else to the trip. Super Mileage Club will meet on the following dates: March 8th and 22nd. Times are 7-8:15 a.m. and/or 3:45-5:30 p.m. Reminder: Merit on the Move runs from 3:45-5:45 p.m. every Wednesday and Thursday afternoon through May in the Apex Lab. If you signed up to take a class, but don’t show up, your spot may be given to another student. If you have any questions email Mr. Wolf. Congratulations to the 70 Goshen Orchestra students (21 solos and 17 ensembles) who participated in the State Instrument Solo & Ensemble Event in Indianapolis this past Saturday. Many great performances were had resulting in 36 gold ratings and two silver ratings. Freshmen violinist Caroline Greaser achieved a perfect score not only at the district event but at the state competition as well. Many great things in store for these awesome musicians! Tickets for the spring musical “Mary Poppins” are now on sale in the choir office. The tickets are $10 for adults and $8 for students through high school age. The seating is reserved so be sure to purchase your tickets with the people you plan to sit with at the show. Show times are March 10th, 11th and 12th at 7:00 p.m. and matinees/afternoon shows on the 12th and 13th at 2:00 p.m. Plan now to attend and watch this great show full of fun music! You will also see some tremendous “flying” affects. For further information contact the choir office. Congratulations to Hudson Kay for finishing 9th at state in diving, ending the season breaking three other schools six dive pool records – Elkhart Central, Northridge and Wawasee. He also broke both our own six dive and 11 dive records this season. Good luck diving at West Point next year Hudson! If you are interested in trying out for the girls softball team on Monday, March 7th, you need to have all of your paperwork completed before trying out. Tryouts will take place from 4:00-6:00 p.m. in the warehouse. If you have any questions please contact Coach Kulp. On Thursday there will be a final meeting during the 2nd session of SRT for those students interested in being on the Unified Track & field team as a student partner. All students are welcome, but winter and fall student-athletes not in a spring sport are prime candidates for this since they already have all of their paperwork completed. Key Club will meet in the cafeteria on Thursday during the 2nd session of SRT. ALL KEY CLUB MEMBERS MUST ATTEND because we will take our club photo for the yearbook and hold elections. Please wear your Key Club t-shirt. Contact Mrs. Dillman at adillman@staff.goshenschools.org if you have any questions. The varsity boys basketball team used hot shooting to win at Manchester 59-42 on Friday night. The RedHawks connected on ten three-pointers and seven players scored at least five points, including Colton Potter who led the team with 12 points. Eliot Nafziger added 11. The JV boys basketball team lost at Manchester 37-34 on Friday night. Michael Pinarski led the RedHawks with 13 points and Will Line added seven in the loss. The JV RedHawks finished the season 14-8. Reminder: It’s not too late to order your 2015-2016 yearbook. Purchase one now for $50 before the price goes up! Order online at Jostens.com. The pedestrian sidewalk has been removed from 9th Street and Logan. You can no longer cross the tracks there. If you need to cross the tracks, please take Washington to 8th Street and then cross over the Lincoln Ave. railroad tracks. Goshen Police Dept. has had several reports of students disregarding the signs that are posted and crossing at 9th Street and Logan. If you continue to cross there, you will be cited by the police department for trespassing on railroad property. This is a safety issue, as some students have almost been hit by passing trains. We thank you in advance for your cooperation. Nelson’s Catering & Fundraising is now hiring part-time caterers! You can apply online at http://nelsonsbbq.com/careers or at their office on Nelson’s Parkway in Wakarusa. The Career Center field trip has been rescheduled for March 3rd. We will leave at 9:20 a.m. and return by 11:45 a.m. Please meet at door M by 9:15 a.m. that day. Only students who turned in their permission slip and are on the list in Guidance can go. The bus is full, so we are not able to add anyone else to the trip. Attention senior boys: Mr. GHS applications are due TODAY to Mrs. Newport in room 3200. Please note that this is a change from the original due date. Boys soccer open play has been canceled for the remainder of the indoor season. We will start open play again after spring break when we will be heading outside for open play. The guidance office has received several new scholarships. Please stop in to pick up applications! All-tourney tickets are now available in the athletic office for the Boys Basketball Sectionals held at Northside Gym in Elkhart. Goshen will play Elkhart Memorial at 6:00 p.m. on Wednesday, March 2nd. Tickets are $10 and will be sold Tuesday through Friday in the athletic office. Game 1 has Penn playing Northridge on Tuesday, March 1st at 7:00 p.m. while Game 3 is Concord vs. Elkhart Central on Wednesday night at 7:30 p.m. Attention Wrestlers: We will have our end of the year meeting after school TODAY in room 6240, the fitness room classroom. All wrestlers are expected to attend. We will also clean out lockers so bring a bag. Those in a spring sport are still expected to attend. IHSAA Student-Athlete Tip of the Week: Have you ever been in a situation in the classroom or in a sport where you thought about giving up? What brought the situation about? Was the class too hard? In your sport, were you lacking playing time or not playing at all? Regardless of your circumstances, it can be frustrating when things look bleak. How can you change your approach to help your frustration? A quote I saw on a poster when recently entering a gymnasium says it best. “You are not finished when you lose. You are finished when you quit.” The next time you think about giving up, remember this quote. You might not always win, but by not quitting you will never lose! On Thursday, March 3rd there will be a final meeting during the 2nd session of SRT for those students interested in being on the Unified Track & field team as a student partner. All students are welcome, but winter and fall student-athletes not in a spring sport are prime candidates for this since they already have all of their paperwork completed. Key Club will meet in the cafeteria on Thursday, March 3rd during the 2nd session of SRT. ALL KEY CLUB MEMBERS MUST ATTEND because we will take our club photo for the yearbook and hold elections. Please wear your Key Club t-shirt. Contact Mrs. Dillman at adillman@staff.goshenschools.org if you have any questions. The boys diving state prelims will be tonight at IUPUI. The boys JV and varsity basketball teams will play at Manchester. JV starts at 6:15 p.m., followed by varsity at 7:45 p.m. The boys state diving prelims will be held at IUPUI. The boys state diving finals will be held at IUPUI. All Goshen Schools will be on a 2 hour delay for Thursday, Feb. 25, 2016 due to severe weather. Due to the weather, all after school activities are canceled for this evening. Detention and Merit on the Move are also canceled. All physical education and fitness classes at GHS will be swimming through Friday at the new aquatics facility on the Goshen Middle School campus. Students should be prepared to travel to GMS by arriving to class on time with proper swimming clothes. Reminder: Merit on the Move starts TODAY and runs from 3:45-5:45 p.m. every Wednesday and Thursday afternoon through May in the Apex Lab. If you signed up to take a class, but don’t show up, your spot may be given to another student. If you have any questions email Mr. Wolf. Attention senior boys: Mr. GHS applications are due on Friday to Mrs. Newport in room 3200. Please note that this is a change from the original due date. On Thursday, there will be a parent and player meeting at 6:30 p.m. for all boys and girls track athletes. The general meeting will be in the cafeteria beginning at 6:30 p.m. with a break out session for each team immediately following. All student-athletes and one parent or guardian are expected to attend. The boys varsity basketball team defeated West Noble 54-42. Goshen was led in scoring by Brady Bechtel with 15 points, Colton Potter with 12 points and CJ Detweiler with 11 points. The JV boys basketball team defeated West Noble 43-35. Goshen was led in scoring by Will Line with 11 points and Michael Pinarski with nine points. Super Mileage Club will meet on the following dates: February 23rd & March 8th and 22nd. Times are 7-8:15 a.m. and/or 3:45-5:30 p.m. Seniors: Ivy Tech will be here TODAY from 9:00 a.m.-12:00 p.m. for an onsite admissions visit. Find out on the spot if you are accepted! Stop in guidance to sign up. The Boys & Girls Club will host FAFSA Night TONIGHT from 5:30-7:00 p.m. at the Learning Center. This is open to high school seniors and your parents. Get a jump start on your financial aid for college! Please bring your tax return if you have finished your taxes. Reminder: Merit on the Move starts tomorrow and runs from 3:45-5:45 p.m. every Wednesday and Thursday afternoon through May in the Apex Lab. If you signed up to take a class, but don’t show up, your spot may be given to another student. If you have any questions email Mr. Wolf. Congratulations to vocal and piano soloists and ensembles that performed Saturday at State Solo and Ensemble Contest in Indianapolis. Goshen students performed very well! Thirty soloists and ensembles received gold ratings. Way to go GHS! Tuesday Stay In Bounds ambassador visits are TODAY! If you need to leave at the end of 2nd period at 9:55 a.m. to get there on time, please clarify that with your 2nd period teacher. Those that have time to travel, you should wait until the announcements and computer check are over at 10:05 a.m. to come to the welcome center. Thanks to all students who helped with the Special Olympics fundraiser and Unified Track & Field awareness last week. The fundraiser at the basketball game on Friday night raised $800 for Indiana Special Olympics and the Polar plunge pledges raised $53.00. Every dollar helps! Attention Wrestlers: We will have our end of the year meeting after school tomorrow in room 6240, the fitness room classroom. All wrestlers are expected to attend. We will also clean out lockers so bring a bag. Those in a spring sport are still expected to attend. The boys varsity dive team will compete in regionals at Mishawaka High School at 6:00 p.m. The boys JV and varsity basketball teams will play at West Noble. JV starts at 6:00 p.m., followed by varsity at 7:30 p.m. Seniors: Ivy Tech will be here tomorrow from 9:00 a.m.-12:00 p.m. for an onsite admissions visit. Find out on the spot if you are accepted! Stop in guidance to sign up. The Boys & Girls Club will host FAFSA Night tomorrow from 5:30-7:00 p.m. at the Learning Center. This is open to high school seniors and your parents. Get a jump start on your financial aid for college! Please bring your tax return if you have finished your taxes. Reminder: Merit on the Move starts this Wednesday and runs from 3:45-5:45 p.m. every Wednesday and Thursday afternoon through May in the Apex Lab. If you signed up to take a class, but don’t show up, your spot may be given to another student. If you have any questions email Mr. Wolf. The varsity boys basketball team lost to Westview 57-55 on Friday night. CJ Detweiler led the RedHawks with 19 points and Cam Kline added 15 in the loss. The JV boys basketball team defeated Westview 21-19. Will Line had nine points to lead the RedHawks and Michael Pinarski added eight. The varsity boys basketball team lost to the visiting LaPorte Slicers 58-43. Eliot Nafziger led the RedHawks with 11 points and Mitchell Walters added 10. Brady Bechtel led the Hawks with six assists. The JV boys basketball team defeated LaPorte 41-29. Michael Pinarski led the RedHawks with 16 points, and Will Line stuffed the stat sheet with seven points, 10 rebounds and seven assists. Thank you to all who came in this morning to be a part of the Schools Rule segment on WNDU! Good luck to our boys swim/dive kids in sectionals, our boys basketball team, Derek Paz at state wrestling and our vocal music groups at state this weekend! Tonight the boys basketball team hosts Westview for Senior night and we will also use this night to promote our Unified Track program and raise money for Indiana Special Olympics. The cheer team will also have a special performance at halftime. All physical education and fitness classes at GHS will be swimming through February 26th at the new aquatics facility on the Goshen Middle School campus. Students should be prepared to travel to GMS by arriving to class on time with proper swimming clothes. Are you a junior or senior interested in a college visit on Tuesday to visit Indiana Tech University in Ft. Wayne? There is no charge and lunch will be provided by the university. See Ms. Hollinger in Guidance for permission slips. Spots are limited so don’t waste time! Students who signed up and turned their permission slip in do not need to report to their 2nd period class, but can come directly to the old pool doors outside the main office where we will leave promptly at 8:25 a.m. Don’t be late! Honoring the Tradition of the GHS Mascot: Tomorrow, prior to the home GHS Boys Basketball game vs. LaPorte, Goshen Community Schools will host an open house to honor our proud tradition at the Goshen Redskins. The open house will be held from 4:30-6:00 p.m. in the GHS cafeteria. The open house will have memorabilia from our many years as the Goshen Redskins, the unveiling of a design for a commemorative display case in the GHS athletic area, the unveiling of a commemorative plaque and the induction of “the Chief” into the GHS athletic wall of fame. Seniors: Ivy Tech will be here on Tuesday from 9:00 a.m.-12:00 p.m. for an onsite admissions visit. Find out on the spot if you are accepted! Stop in guidance to sign up. The Boys & Girls Club will host FAFSA Night on Tuesday from 5:30-7:00 p.m. at the Learning Center. This is open to high school seniors and your parents. Get a jump start on your financial aid for college! Please bring your tax return if you have finished your taxes. If you are looking for full time employment working 2nd shift, visit Crane Composites at 2424 E. Kercher Rd. to fill out an application in person. You can also call 534-0010 if you have any questions about the positions that are available. The Unified Track & Field fundraiser for Indiana Special Olympics will be tonight during the boys basketball game. Any student interested in helping with the Unified Track & field program can stop by the table in the Red Zone at lunch TODAY to get more information and to sign up to help. Attention Students: Do you need to perform community service this semester? The Feed the Children Distribution Warehouse and Teacher Store in Elkhart needs volunteers for two hours tomorrow from 10:00 a.m. to 12:00 p.m. to help sort and package donations of books and school supplies. Students will need to have a signed waiver and their own transportation. Email Mrs. Dillman at adillman@staff.goshenschools.org if you can help or would like more information. Reminder: Merit on the Move starts on Wednesday and runs from 3:45-5:45 p.m. every Wednesday and Thursday afternoon through May in the Apex Lab. If you signed up to take a class, but don’t show up, your spot may be given to another student. If you have any questions email Mr. Wolf. This Sunday is College Goal Sunday at various sites throughout the US. You can get FREE help filing your FAFSA (Free Application for Federal Student Aid) to meet the deadline on March 10th at Goshen College (Union Building) from 2:00-4:00 p.m. or at IUSB (Education Arts Building, 1002 S. Esther St., South Bend) at 2:00 p.m. There will be Spanish interpreters available at both sites. No sign-up is necessary…..just show up! Attention senior boys: Mr. GHS applications are due next Friday, February 26th to Mrs. Newport in room 3200. Please note that this is a change from the original due date. IHSAA Student-Athlete Tip of the Week: Are you familiar with your school’s athletic code of conduct? I’m sure it is discussed at the beginning of each sport as you start that season. All student-athletes need to be aware of the do’s and don’ts of what is expected, in and out of season. Rules and regulations are laid out and you are expected to follow them. If you have any questions or you are not sure of a rule, sit down with a coach or the athletic director for any clarity. Following these rules is a no-brainer. Don’t look for shortcuts and exceptions. If you do something wrong, expect to pay the consequences! There were 48 German students who participated in a conference last weekend at Ball State University. A special congratulations goes to Julia Giddens for placing 1st in the Level 2 Vocabulary and 3rd in the Level 2 Impromptu Speaking and Cade Cleveland for placing 3rd in the Level 2 Spelling! Herzlichen Glückwünsch! Boys varsity wrestling state prelims will be tonight at 5:30 p.m. in Indy at Banker’s Life Stadium. The boys JV and varsity basketball teams will host Westview. JV plays at 6:00 p.m., followed by varsity at 7:30 p.m. Boys varsity wrestling competes at state starting at 9:30 a.m. in Indy at Banker’s Life Stadium. The boys varsity sectional diving prelims are at 9:00 a.m. at Northridge, with sectional finals being at 1:00 p.m. The boys JV and varsity basketball teams will host LaPorte. JV plays at 6:00 p.m., followed by varsity at 7:30 p.m.
Parent/Teacher conferences are tonight from 4-8:00 p.m. in the cafeteria and commons area. Reminder: We will be featured TOMORROW on the Schools Rule segment on WNDU. Please join us at 5:30 a.m. Rise-n-Roll doughnuts are included! Wear your club gear, RedHawks attire or just dress in school colors. We hope to see you bright and early to show your school spirit to all of Michiana! Tomorrow night the boys basketball team hosts Westview for Senior night and we will also use this night to promote our Unified Track program and raise money for Indiana Special Olympics. The cheer team will also have a special performance at halftime. Are you a junior or senior interested in a college visit on February 23rd to visit Indiana Tech University in Ft. Wayne? There is no charge and lunch will be provided by the university. See Ms. Hollinger in Guidance for permission slips. Spots are limited so don’t waste time! Students who signed up and turned their permission slip in do not need to report to their 2nd period class, but can come directly to the old pool doors outside the main office where we will leave promptly at 8:25 a.m. Don’t be late! Honoring the Tradition of the GHS Mascot: Saturday, prior to the home GHS Boys Basketball game vs. LaPorte, Goshen Community Schools will host an open house to honor our proud tradition at the Goshen Redskins. The open house will be held from 4:30-6:00 p.m. in the GHS cafeteria. The open house will have memorabilia from our many years as the Goshen Redskins, the unveiling of a design for a commemorative display case in the GHS athletic area, the unveiling of a commemorative plaque and the induction of “the Chief” into the GHS athletic wall of fame. The Unified Track & Field fundraiser for Indiana Special Olympics will be tomorrow night during the boys basketball game. Students will be at a table during lunch periods answering questions about this program. Get involved GHS! Attention Students: Do you need to perform community service this semester? The Feed the Children Distribution Warehouse and Teacher Store in Elkhart needs volunteers for two hours this Saturday from 10:00 a.m. to 12:00 p.m. to help sort and package donations of books and school supplies. Students will need to have a signed waiver and their own transportation. Email Mrs. Dillman at adillman@staff.goshenschools.org if you can help or would like more information. Reminder: Merit on the Move starts next Wednesday, February 24th and runs from 3:45-5:45 p.m. every Wednesday and Thursday afternoon through May in the Apex Lab. If you signed up to take a class, but don’t show up, your spot may be given to another student. If you have any questions email Mr. Wolf. IHSAA Student-Athlete Tip of the Week: Are you familiar with your school’s athletic code of conduct? I’m sure it is discussed at the beginning of each sport as you start that season. All student-athletes need to be aware of the do’s and don’ts of what is expected, in and out of season. Rules and regulations are laid out and you are expected to follow them. If you have any questions or you are not sure of a rule, sit down with a coach or the athletic director for any clarity. Following these rules is a no-brainier. Don’t look for shortcuts and exceptions. If you do something wrong, expect to pay the consequences! Tonight at 7:30 p.m. in the Goshen High School Auditorium, state qualifying vocal ensembles and senior vocal soloists will present a recital. This is a free event. Please join us in supporting these students who will be competing in Indianapolis on Saturday. The boys varsity swim & dive team will compete in sectionals at 5:30 p.m. at Northridge. Good luck gentlemen! 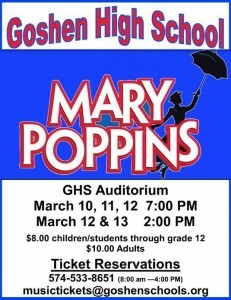 This year the GHS musical, Mary Poppins, is a one-week run, so there will not be as many performances. Place your ticket order now for the best possible seats. You will not want to miss our wonderful students in action!! Goshen High School parent teacher conferences are scheduled for Thursday, February 18th. The conferences are from 4 to 8 p.m. in the cafeteria and commons area. The conferences will be arena style. Parents and guardians will receive progress reports during the conferences. Goshen High School’s bookkeeper will also be available for textbook rental payments. For more information, contact Goshen High School at 533-8651. Reminder: We will be featured this Friday on the Schools Rule segment on WNDU. Please join us at 5:30 a.m. Rise-n-Roll doughnuts are included! Wear your club gear, RedHawks attire or just dress in school colors. We hope to see you bright and early to show your school spirit to all of Michiana! Friday night the boys basketball team hosts Westview for Senior night and we will also use this night to promote our Unified Track program and raise money for Indiana Special Olympics. The cheer team will also have a special performance at halftime. Honoring the Tradition of the GHS Mascot: On February 20th, prior to the home GHS Boys Basketball game vs. LaPorte, Goshen Community Schools will host an open house to honor our proud tradition at the Goshen Redskins. The open house will be held from 4:30-6:00 p.m. in the GHS cafeteria. The open house will have memorabilia from our many years as the Goshen Redskins, the unveiling of a design for a commemorative display case in the GHS athletic area, the unveiling of a commemorative plaque and the induction of “the Chief” into the GHS athletic wall of fame. Seniors: Ivy Tech will be here on Tuesday, February 23rd from 9:00 a.m.-12:00 p.m. for an onsite admissions visit. Find out on the spot if you are accepted! Stop in guidance to sign up. The Boys & Girls Club will host FAFSA Night on February 23rd from 5:30-7:00 p.m. at the Learning Center. This is open to high school seniors and your parents. Get a jump start on your financial aid for college! Please bring your tax return if you have finished your taxes. The Unified Track & Field fundraiser for Indiana Special Olympics will be this Friday night during the boys basketball game. Students will be at a table during lunch periods answering questions about this program. Get involved GHS! Attention Students: Do you need to perform community service this semester? The Feed the Children Distribution Warehouse and Teacher Store in Elkhart needs volunteers for two hours this Saturday, February 20th from 10:00 a.m. to 12:00 p.m. to help sort and package donations of books and school supplies. Students will need to have a signed waiver and their own transportation. Email Mrs. Dillman at adillman@staff.goshenschools.org if you can help or would like more information. This Sunday, February 21st is College Goal Sunday at various sites throughout the US. You can get FREE help filing your FAFSA (Free Application for Federal Student Aid) to meet the deadline on March 10th at Goshen College (Union Building) from 2:00-4:00 p.m. or at IUSB (Education Arts Building, 1002 S. Esther St., South Bend) at 2:00 p.m. There will be Spanish interpreters available at both sites. No sign-up is necessary…..just show up! Thank you to all who visited Bob Evans last week in support of GHS! Your support is appreciated! All physical education and fitness classes at GHS will be swimming starting today through February 26th at the new aquatics facility on the Goshen Middle School campus. Students should be prepared to travel to GMS by arriving to class on time with proper swimming clothes. Are you a junior or senior interested in a college visit on February 23rd to visit Indiana Tech University in Ft. Wayne? There is no charge and lunch will be provided by the university. See Ms. Hollinger in Guidance for permission slips. Spots are limited so don’t waste time! Goshen Public Library offers several FREE activities for young adults monthly in grades 6-12. You are invited to stop in on Thursdays after school from 4-6:00 p.m. to hang out, study, find an independent reading book, play a board game, color or just chillax at the teen café! We’ll have hot chocolate and coffee! We also have two NEW clubs continuing in February! Weebz Anonymous, our manga club, meets first and third Wednesdays from 4-5:00 p.m. and Courageous Pages, our creative writing club, meets fourth Wednesdays from 4-6:00 p.m. in the teen area. Our regular monthly programming continues on Thursday with our Pages & Popcorn club from 5:30-8:00 p.m. We’ll talk about the book Nick and Norah’s Infinite Playlist and watch the movie. Nerd’s Night Out: Music Nerd Night happens Friday, February 26th from 6-8:00 p.m. with karaoke and a “name that tune” game with pizza and prizes. Finally, our regular programming will conclude this month with the Crafty Bandits, which will meet on Monday, February 29th from 4:30-6:30 p.m. to have snacks and learn how to melt crayons with hairdryers to make interesting art. To sign up or for more information about our programs, stop by the library or check out our GPL Teens webpage, Facebook or Twitter. Due to no school last Thursday, the February planning meeting for Stay In Bounds ambassadors is today during the 2nd session of SRT in the main gym. Students will make their normal February Thursday visits to elementary schools this Thursday, and the Tuesday visits will be next Tuesday, February 23rd. The boys freshman basketball team defeated Penn 29-18. Goshen was led in scoring by Bryant Robinson with 13 points and Eric Newell with seven points. The JV boys basketball team won 25-24 at Wawasee. Lucas Bontreger led the RedHawks with 10 points and Simon Myers added seven. The varsity boys basketball team won 68-57 at Wawasee on Friday night. CJ Detweiler led the RedHawks with 22 points and seven rebounds, while Brady Becthel added 18 points and five assists. Mitchell Walters added 11 points and Colton Potter contributed eight. The boys freshman basketball team defeated Concord 33-22. Goshen was led in scoring by Porter Revoir with 12 points, Eric Newell with nine points, Joseph Good and Bryant Robinson with five points each and Ben Bontrager-Singer with two points. The boys freshman basketball team defeated Plymouth 47-26. Goshen was led in scoring by Joseph Good with 12 points, Eric Newell with 10 points, Porter Revoir with eight points, Bryant Robinson with seven points, Ben Bontrager-Singer with six points and Jesus Mata and Austin Cain with two points each. This past week at our National Honor Society (NHS) meeting, one of our co-presidents, Liz Erickson, came up with the idea to have some teachers come in to speak about their career paths and college experiences. These teachers included Mrs. Charlene Cook, Mr. Chad Collins, Mr. Kyle Park, Mr. Jeremy McLaughlin, and Mrs. Kelly Whittaker. But what was different about these speakers was that they all went through life making a significant change. These are role models that we see every day at the high school, who one day decided that they wanted to take a different path. These changes ranged from changing majors, changing colleges, and changing jobs. But what really stuck out to me was that none of these teachers were afraid to follow their gut and chase after what they were naturally good at. Many seniors feel as though there is some type of pressure that everyone must have their entire life planned out by the time they go to college. On the flip side, many others believe that they are destined for a particular field and they could never see themselves doing anything else. These teachers helped us understand that we don’t need to know what we want to do for the rest of our lives right now, and if we do know, we must understand that changing our minds is always an option. Personally, hearing these teachers speak made me realize that next year at college I will be starting a new journey filled with new opportunities and new ideas. I know from talking to others that they feel better about not knowing exactly what to major in, because life will always unfold the way it is meant to as we gather new experiences. It was wonderful to hear the back-stories of the teachers we know and love, and how they came to be where they are today. These are the type of role models that will continue to inspire us long after high school. This was certainly one of the most beneficial opportunities we have had in NHS for both juniors and seniors! Thank you, Molly, for reporting on this wonderful presentation. Also, thank you to the staff members who were willing to share more with students about their own college and career paths. This week is Bob Evans Give Back week! They will donate 15% of their sales to GHS. This works for carry out and dine in. You can pick up a coupon in the main office or you can just simply tell them it is for GHS. This is for the entire week, and it applies to ALL sales, not just the specials listed on the coupon. Take the family out for food and fun anytime between now-Saturday and help earn money for GHS! All physical education and fitness classes at GHS will be swimming from February 16th-26th at the new aquatics facility on the Goshen Middle School campus. Students should be prepared to travel to GMS by arriving to class on time with proper swimming clothes. Seniors: Please make sure you return your completed Kiwanis scholarship application to Ms. Hollinger in the guidance office by February 15th. Goshen Public Library offers several FREE activities for young adults monthly in grades 6-12. You are invited to stop in on Thursdays after school from 4-6:00 p.m. to hang out, study, find an independent reading book, play a board game, color or just chillax at the teen café! We’ll have hot chocolate and coffee! We also have two NEW clubs continuing in February! Weebz Anonymous, our manga club, meets first and third Wednesdays from 4-5:00 p.m. and Courageous Pages, our creative writing club, meets fourth Wednesdays from 4-6:00 p.m. in the teen area. Our regular monthly programming continues on Thursday, February 18th with our Pages & Popcorn club from 5:30-8:00 p.m. We’ll talk about the book Nick and Norah’s Infinite Playlist and watch the movie. Nerd’s Night Out: Music Nerd Night happens Friday, February 26th from 6-8:00 p.m. with karaoke and a “name that tune” game with pizza and prizes. Finally, our regular programming will conclude this month with the Crafty Bandits, which will meet on Monday, February 29th from 4:30-6:30 p.m. to have snacks and learn how to melt crayons with hairdryers to make interesting art. To sign up or for more information about our programs, stop by the library or check out our GPL Teens webpage, Facebook or Twitter. Goshen HS is starting a Unified Track & Field team this spring. This Indiana High School Athletic Association sport partners special needs students with regular education students in five different track & field events. The team begins practices the week of March 14th and will practice two times a week through the end of the school year with three meets in May. If you are interested in being a “student partner” or volunteer to help with fundraising or promotion, please stop by the table in the RedZone at lunch TODAY to get more information. One student and one staff member from the team have agreed to do the “polar plunge” in Warsaw on February 20th to raise money for Special Olympics. Today, there will be containers with different names on them at the table. The staff member and student whose names have the most money in them will be committed to do the plunge. This will be videoed for all of your enjoyment. The staff promises to invoke the “no Speedo” policy. Unified track coaches Mr. Smuts and Mr. Mullett as well as Mr. Kissinger are the staff members committed to taking the plunge so far. Students committed for the plunge so far are Kyrie Potter, Logan Holdeman, Courtney Pollock and Jeffrey Stoll. Thanks for your support GHS! IHSAA Student-Athlete Tip of the Week: All student-athletes like a pat on the back from time to time. It’s human nature. Are you good at handing out the pat on the back? Do you make a conscious effort to do so? There’s nothing wrong with complimenting a teammate, teacher, coach or classmate. In fact, I highly encourage it. So many times the student-athlete gets caught up worrying too much about themselves and how they are feeling and forgetting about others that they come in contact with on a daily basis. Make it a point to give a daily compliment to someone at your school. Be someone who can pick others up and be a positive influence on all of those around you! The boys freshman basketball team defeated Fort Wayne Canterbury 37-34. Goshen was led in scoring by Porter Revoir with 12 points and Joseph Good with eight points. The varsity boys basketball team defeated Lakeland 54-33. Eliot Nafziger led the RedHawks with 11 points, Brady Bechtel had 10 points and Cam Kline added nine points. CJ Detweiler led Goshen with eight rebounds, while Bechtel had five assists. The JV boys basketball team defeated Lakeland 44-30. Michael Pinarski led the RedHawks with 15 points and Will Line added 12. Pinarski also had six rebounds and Lucas Bontreger had five assists. The boys freshman basketball team will host Penn at 6:30 p.m. The boys JV and varsity basketball teams will play at Wawasee. JV plays at 6:15 p.m., followed by varsity at 7:30 p.m. The boys varsity wrestling team will compete in semi state at the Allen County Coliseum at 8:30 a.m. The boys freshman basketball team will host the freshman NLC Tourney at 9:00 a.m. The boys JV and varsity basketball teams will play at East Noble. JV plays at 6:00 p.m., followed by varsity at 7:30 p.m.
GCS has implemented a new Raptor System to screen visitors as they enter GHS, GMS & Merit. Read the Elkhart Truth’s write up by clicking here. For more information on Goshen Community School’s safety measures visit our website or click here. The next boys soccer open play will be on Thursday. IUSB will be here TODAY for an onsite admissions visit. There are still several spots open to meet with an admissions rep. Stop in Guidance today to sign up! Super Mileage Club will meet on the following dates: February 9th and 23rd & March 8th and 22nd. Times are 7-8:15 a.m. and/or 3:45-5:30 p.m. Honoring the Tradition of the GHS Mascot: On February 20th, prior to the home GHS Boys Basketball game vs. LaPorte, Goshen Community Schools will host an open house to honor our proud tradition at the Goshen Redskins. The open house will be held from 4:30-6:00 p.m. in the GHS cafeteria. The open house will have memorabilia from our many years as the Goshen Redskins, the unveiling of a design for a commemorative display case in the GHS athletic area, the unveiling of a commemorative plaque and the induction of “the Chief” into the GHS athletic wall of fame. In advance of this event, a commemorative tee shirt has been designed featuring both the Redskin and the new RedHawk mascot and is available for purchase via the internet at http://tinyurl.com/zxtvrdv. If you do not feel comfortable ordering online, phone orders will be taken by calling Lori Martin at GCS central office at (574) 533-8631. All proceeds from these shirts will be designated to supplement the costs of the new display case to honor the Redskin mascot. These shirts will only be available until February 4th so that they can be distributed at the open house on February 20th. After the open house, plans are for the window to re-open for a brief period. Seniors: There are numerous local scholarships available to you through GHS Dollars for Scholars and the Community Foundation of Elkhart County. These scholarships apply to students pursuing post-secondary education at two-year colleges, four-year colleges or at vocational/technical schools. If you need help completing the GHS Dollars for Scholars online scholarship application or have other scholarship questions counselors will be available to help in the Guidance Office Conference room TODAY during SRT. Make sure to bring your laptop. Goshen HS is starting a Unified Track & Field team this spring. This Indiana High School Athletic Association sport partners special needs students with regular education students in five different track & field events. The team begins practices the week of March 14th and will practice two times a week through the end of the school year with three meets in May. If you are interested in being a “student partner” or volunteer to help with fundraising or promotion, please stop by the table in the RedZone at lunch on tomorrow to get more information. One student and one staff member from the team have agreed to do the “polar plunge” in Warsaw on February 20th to raise money for Special Olympics. Tomorrow, there will be containers with different names on them at the table. The staff member and student whose names have the most money in them will be committed to do the plunge. This will be videoed for all of your enjoyment. The staff promises to invoke the “no Speedo” policy. Unified track coaches Mr. Smuts and Mr. Mullett as well as Mr. Kissinger are the staff members committed to taking the plunge so far. Students committed for the plunge so far are Kyrie Potter, Logan Holdeman, Courtney Pollock and Jeffrey Stoll. Thanks for your support GHS! There will be a call out meeting during the 2nd session of SRT in room 2190 for anyone interested in a fantasy book club. The boys JV and varsity basketball teams will host Lakeland. JV plays at 6:00 p.m., followed by varsity at 7:30 p.m. The boys freshman basketball team will compete at FW Canterbury at 6:00 p.m.
IUSB will be here tomorrow for an onsite admissions visit. There are still several spots open to meet with an admissions rep. Stop in Guidance today to sign up! Seniors: There are numerous local scholarships available to you through GHS Dollars for Scholars and the Community Foundation of Elkhart County. These scholarships apply to students pursuing post-secondary education at two-year colleges, four-year colleges or at vocational/technical schools. If you need help completing the GHS Dollars for Scholars online scholarship application or have other scholarship questions counselors will be available to help in the Guidance Office Conference room tomorrow during SRT. Make sure to bring your laptop. Sophomore student-athletes who have signed up for the Best the Best leadership workshop tomorrow need to report to the auditorium to start your day. Please bring a pen or pencil and a great attitude. Thanks for getting involved! Goshen HS is starting a Unified Track & Field team this spring. This Indiana High School Athletic Association sport partners special needs students with regular education students in five different track & field events. The team begins practices the week of March 14th and will practice two times a week through the end of the school year with three meets in May. If you are interested in being a “student partner” or volunteer to help with fundraising or promotion, please stop by the table in the RedZone at lunch on Wednesday to get more information. One student and one staff member from the team have agreed to do the “polar plunge” in Warsaw on February 20th to raise money for Special Olympics. On Wednesday, there will be containers with different names on them at the table. The staff member and student whose names have the most money in them will be committed to do the plunge. This will be videoed for all of your enjoyment. The staff promises to invoke the “no Speedo” policy. Unified track coaches Mr. Smuts and Mr. Mullett as well as Mr. Kissinger are the staff members committed to taking the plunge so far. Students committed for the plunge so far are Kyrie Potter, Logan Holdeman, Courtney Pollock and Jeffrey Stoll. Thanks for your support GHS! At Saturday’s District Solo & Ensemble event, Goshen High School was represented by 40 soloists and 20 ensembles from all GHS choirs and four pianists. Thirty six solos received Gold ratings and 26 qualified for State. Eighteen ensembles received Gold and 12 qualified for State. State Solo & Ensemble contest will be held on February 20th at Perry Meridian High School. The next boys soccer open play will be on Thursday, February 11th. The guidance office has received two general scholarships, the Niccum and the John A. & Dorothy H. Geyer. Stop by for more information! Seniors: IUSB will be here on Tuesday for an onsite admissions visit. Have your application fee waived, see if you qualify for a $500 scholarship and receive an admissions decision on the spot! Sign up in guidance now, as slots go fast! Honoring the Tradition of the GHS Mascot: On February 20th, prior to the home GHS Boys Basketball game vs. LaPorte, Goshen Community Schools will host an open house to honor our proud tradition at the Goshen Redskins. The open house will be held from 4:30-6:00 p.m. in the GHS cafeteria. The open house will have memorabilia from our many years as the Goshen Redskins, the unveiling of a design for a commemorative display case in the GHS athletic area, the unveiling of a commemorative plaque and the induction of “the Chief” into the GHS athletic wall of fame. In advance of this event, a commemorative tee shirt has been designed featuring both the Redskin and the new RedHawk mascot and is available for purchase via the internet at http://tinyurl.com/zxtvrdv. If you do not feel comfortable ordering online, phone orders will be taken by calling Lori Martin at GCS central office at (574) 533-8631. All proceeds from these shirts will be designated to supplement the costs of the new display case to honor the Redskin mascot. These shirts will only be available until February 4th so that they can be distributed at the open house on February 20th. After the open house, plans are for the window to re-open for a brief period.IHSAA Student-Athlete Tip of the Week: Playing team sports can be a fun and rewarding experience. It can also be challenging and frustrating at times. Regardless, very few teams finish the season with the same starting line-up or personnel that it began the season with. Whether it’s injuries, coach’s decision, or players making big improvements, the end of the season usually looks nothing like the start. That’s why it is so important that all team members embrace every practice as an opportunity to improve and give themselves a better chance of earning playing time. You never know when your chance will arrive, but chances are you will get your opportunity sometime during a long and arduous season. The student athletic council meeting TODAY during the 2nd session of SRT will be dedicated to planning in regards to the GHS Unified Track & Field team. We need “student partners” that will compete with the Special Olympics students on the team, we need volunteers to promote the team and collect donations at the February 19th home boys basketball and volunteers to participate in a stamp out the “R” word day at GHS. There is also a Polar Plunge in Warsaw on February 20th for which we can participate and raise funds for those interested. BRRRRRR! Mr. Kissinger will bring the hot chocolate. Thanks for getting involved GHS! Greencroft has openings for the following positions: Administrative Assistant, Cook, Dining Attendant, Laundry Aide, Beginning Healthcare Worker, Housekeeper, LPN Nurse and Pantry Team Leader. If you are interested please contact Greencroft at 537-4000. Sophomore student-athletes who have signed up for the Best the Best leadership workshop on Tuesday need to report to the auditorium to start your day. Please bring a pen or pencil and a great attitude. Thanks for getting involved! Goshen HS is starting a Unified Track & Field team this spring. This Indiana High School Athletic Association sport partners special needs students with regular education students in five different track & field events. The team begins practices the week of March 14th and will practice two times a week through the end of the school year with three meets in May. If you are interested in being a “student partner” or volunteer to help with fundraising or promotion, please stop by the table in the Red Zone at lunch on Wednesday, February 10th to get more information. One student and one staff member from the team have agreed to do the “polar plunge” in Warsaw on February 20th to raise money for Special Olympics. On February 10th, there will be containers with different names on them at the table. The staff member and student whose names have the most money in them will be committed to do the plunge. This will be videoed for all of your enjoyment. The staff promises to invoke the “no Speedo” policy. Unified track coaches Mr. Smuts and Mr. Mullett as well as Mr. Kissinger are the staff members committed to taking the plunge so far. Students committed for the plunge so far are Kyrie Potter, Logan Holdeman, Courtney Pollock and Jeffrey Stoll. Thanks for your support GHS! The JV boys basketball team lost in overtime to Plymouth on Thursday night, 46-44. Simon Myers led the RedHawks with 13 points and Philip Wertz contributed ten points. The JV Hawks are now 9-6 on the season and 3-3 in the NLC. The varsity boys basketball team lost to Plymouth on Thursday night, 65-60. Brady Bechtel led the RedHawks with 25 points and CJ Detweiler added ten. Becthel had seven assists, while Detweiler and Colton Potter led the RedHawks with five rebounds apiece. 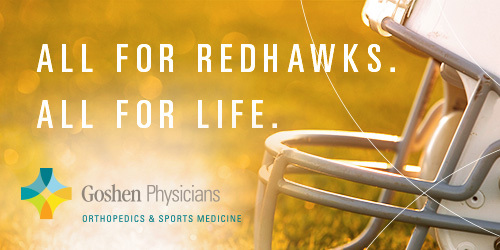 The Hawks are now 4-11 on the season and 2-4 in the NLC. The girls varsity swim/dive team will compete in sectional diving prelims at 9:00 a.m. at Concord. The boys varsity wrestling team will host regionals at 9:30 a.m. The girls varsity swim/dive team will compete in sectional finals at 1:00 p.m. at Concord.